Yesterday I bared it all when I showed you the embarrassing amount of food I had in my pantry when I thought I had “nothing to eat”. With the realization that I had way more food than I thought I decided to challenge myself to cook from my pantry. Using food in my pantry and refrigerator, and not making any special trips to the grocery store. Last night I made my first meal using what I had on hand. These first few meals I’m guessing will probably be easier to put together and better than the ones we eat towards the end of the challenge. Last night’s dinner was so good. It makes me sad I didn’t think about it earlier this summer. With a loaf of crusty bread it would make the easiest summer dinner. This dinner will make a reappearance in our meal line up. Season chicken breasts with salt & pepper on both sides. Coat chicken with a couple good splashes of balsamic vinegar. Heat a skillet or griddle over medium heat. Add butter/oil. Add chicken breasts to the butter and sprinkle the garlic on top of the chicken. Cook about 5 minutes, turn breasts over and cook 4-5 minutes on this side. Stir the garlic so it doesn't burn. Give the chicken breasts another splash of vinegar and a splash of water then reduce down to a lovely brown glaze. Remove chicken and turn off heat and remove pan. Let chicken sit 4-5 minutes before slicing thinly. 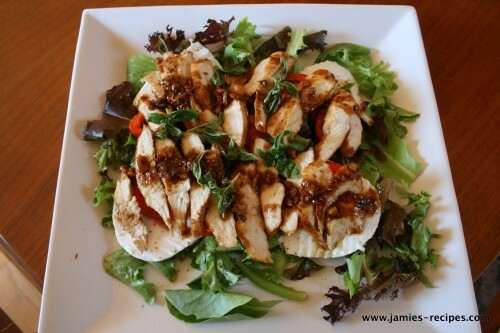 Place chicken on assembled salad and pour glaze over top of the chicken. Top with sliced mozzarella and tomatoes. Salt & pepper according to your taste preferences. 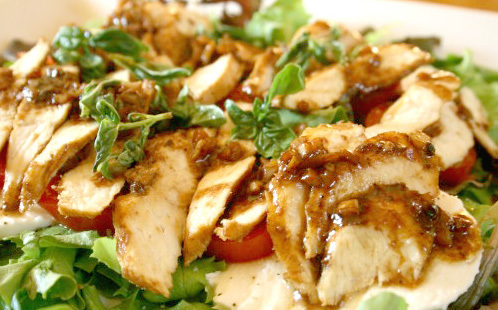 Add sliced balsamic chicken and the balsamic garlic glaze. Top the salad with fresh sprigs of basil. Sounds really good. Maybe will have to try this with Grandpa. But I will have to go to the store to buy a couple of things. Oh, well!!!! Grandma: I know Grandpa would love this salad. You could make it with just one chicken breast and both share it for a light lunch. Alex thinks craisins would be a good addition to the salad. Yum. I like the craisin idea. I didnt join PWs Tasty Kitchen. Instead I read waaay too many other foodies blogs! !